Who doesn’t love the lush, exotic look of tropical plants and flowers? They evoke sunshine, warm breezes and exotic locales. Their vibrant colors and dense green foliage add to gardens, patios, balconies and homes around the world. Have you been tempted to grow tropical flowers and plants, but aren’t sure how to do it in your climate? Here you’ll find simple gardening tips, tricks and different plants that can do well in almost any climate. Some tropical plants are hardy enough to withstand cooler climates, and even those that prefer warmer temperatures can be successfully planted in containers and moved outside when it warms up. If your outdoor space is protected from wind, with areas of bright sun and filtered light, and if you have soil that drains quickly, you have everything you need to get started growing tropical plants and flowers outdoors. Even if you don’t, you can recreate ideal conditions by using containers and starting your plants indoors during the cooler months, before moving them outside in the summer. 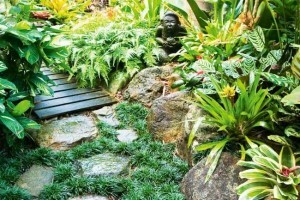 Most tropical plants prefer filtered sunlight and most like plenty of water but require well-drained soil. There are so many tropical plants, it can be hard to know where to start. Think about the space you are trying to fill. If it is outdoors, make sure that there is some established shade before planting or putting containers out. As mentioned above, many tropical plants like filtered light, so before planting, check to see what kind of light your plant needs. Tropical flowers can be ideal, quick-growing plants for small spaces, such as balconies and patios. If you are just interested in having adding some lush, green house-plants to your home, your options range from small shrubs, bushes and plants to dramatic, tall trees and bushes. Check out some of the options below. Some of the most stunning tropical plants are vines, such as bougainvillea, jasmine, passiflora and mandevilla. Bougainvillea vines boast stunning pink flowers. They love lots of direct sunlight and only require minimal water. However, they don’t tolerate freezes and will need to be brought inside once the temperature hits zero unless they are in a protected, sunny spot. 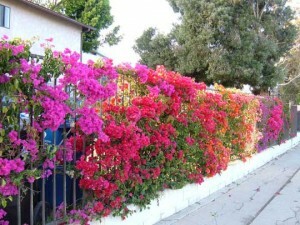 Mandevilla vines are perfect accents on walls and do best with a trellis to climb. Their trumpet-shaped bright pink, red or white flowers will bring a wow factor to patios or balconies that need some sparkle. Jasmine’s lovely, small, star-shaped white flowers are not just beautiful to look at—jasmine has an intense perfume, particularly at night. Passiflora (passionflower) is another lovely, quick-growing tropical vine that does best on a trellis. 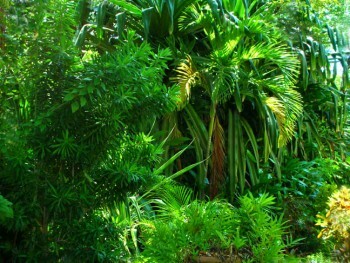 In the tropics it’s a perennial, but in other climates it’s best as an annual or a house-plant. When most of us think of house-plants, these are the plants we think of. They are beautiful inside or out, and, planted in containers, can serve as a perfect contrast to other, more colourful plants. Ficus trees can grow to be quite large. They prefer medium light and like to be at room temperature. Their flat, glossy green leaves add elegance to any room and they can make a dramatic statement in the right space. Philodendrons—remember these? Twenty years ago house plant enthusiasts had these trailing plants strung around living rooms everywhere. Today, it’s easier than ever to grow the non-trailing version and they add a nice touch of green wherever you put them. Diffenbachia, also known as dumb cane, can be grown as a tree-like plant, or as a shrub, with many stems. Be careful, though, its sap is toxic to small children and pets and can cause numbness in the mouth if ingested. Schefflera, or the umbrella tree, is a tree-like bushy plant. Its leaves are attached to a stem in a way that resembles an umbrella, which is how it got its name. These plants like bright light and room temperatures. 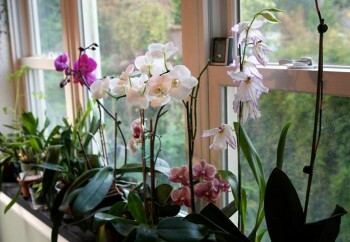 Orchids are the most common tropical flower, found in homes and gardens around the world. They range in size from tiny to statuesque and come in all sorts of colours. What’s not to love about orchids? They work well as house-plants, preferring indirect eastern or northern light and regular watering in well-filtered soil. They also work beautifully as cut flowers in arrangements and can last for weeks before wilting. Bird of Paradise is a dramatic flower in bold, bright tropical colours. It’s lovely as an indoor or outdoor plant and looks amazing in arrangements as well. Canna lilies are another beautiful tropical flower that does well in gardens everywhere. These plants are perennials that prefer lots of sunshine, water and well-fertilized soil. Their bright blooms are available in red, pink, orange, yellow and white. Anthuriums are one of those plants that are just as beautiful outside as inside. Their dramatic foliage paired with stiff, waxy flowers that can be pink, white or red, make them a stunning addition to your garden or home. If you are planting indoors or in a container, make sure you pick one that is large enough to support a big root structure. Under the right conditions, tropical flowers and plants grow quickly and need a bit of room. Use soil that is appropriate to the plant and will permit quick water drainage. Most tropical flowers want plenty of water but do not tolerate sitting in it for long. 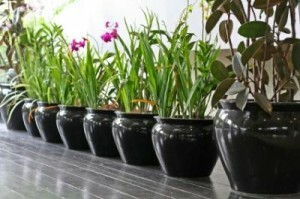 If you have a short growing season, start your tropical plants indoors. While they may be smaller and possibly have fewer flowers than they would in the tropics, they will still add dramatic flair to any space. 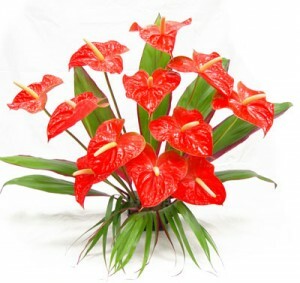 Tropical flowers and plants are wonderful additions to almost any home or garden. Whether you want to create lush, green oases in your home or want to brighten up a dull outdoor wall with a stunning, dramatic vine, there’s a tropical plant that will fit the bill. There are also plenty of choices in between, allowing you to create a special, unique garden, patio or balcony that reflects you. Why do you want to grow a garden? For a floral service in Applecross in Western Australia, visit http://applecross.florist/ for delivery of flowers in Applecross WA. A wide range of arrangements and bouquets with free shipping. Copyright © 2019 Global Gardens Gifts. Powered by WordPress. Theme: Spacious by ThemeGrill.